Exiting Gamberale, proceed on SP 164 towards Palena and turn left at the first fork, after 3.7 km you reach the little church of Sant’Antonio and an area where you may see deer in their natural habitat. You then enter the Regional wood of “Monte Secine” by following the M1 trail. From the fold of Mount Secine, through woodlands and small clearings, you reach a fountain. On the trail you follow the traces of the foxholes and trench corridors of the observation and control emplacements that the German command had built on those slopes, everyone who walks this trail will understand the natural lines of defence here. From the fountain you can take the M2 trail towards the “Fear Pass” (Passo della Paura) 1585 Metres, proceeding north-westward you cross the wood to where you come close to a clearing, the N4 trail which leads to the massive walls of Pietra Cernaia (1645 Metres) and on to a small lake. From here, among the rugged rocks surrounded by wide beech woodlands, you go back on the N2 trail heading south. You will Arrive in the Piana dei Mangini (1626 Metres) where you proceed by taking the N3 trail on the right. On the western wall of the Serra Verticara a view will open up onto the Majella and the summit of Porrara to the North, on mounts Rotella and Pratello to the west and on the slopes of Pescocostanzo and Rivisondoli. Crossing the meadows of the Annunziata you can reach Fonte Santamico. From here you join the N1 trail and, pass the Piazza del Re shelter, you proceed on the trail southward towards the Piana Selvareccia and the rocky eastern wall of the Serra Castellaccio. 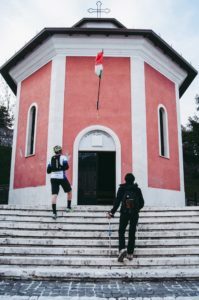 The trail finally arrives at Pietrapensieri (1359 Metres), a hamlet of Roccaraso, and following Via della Pineta you will arrive in the vicinity of the monument for the fallen of Limmari. * for the those of you who are on bikes we advise you to proceed towards Passo della Paura south-westward, crossing the woodland areas and the small clearings to arrive in the vicinity of Piana dei Mangini, right at the intersection of N2 and N3 trails, and then proceed on the N3 southward. From Stazione di Palena you can take the SS84 southward for 8.6 km, turn left on the SS17 towards Roccaraso for 2.2 km and at the fork with the SP84, the new Sangrina, you keep the left, after 4.2 km you will arrive in Pietransieri. Design by Andrea Marzii and Graziano Di Crescenzo. Copyright ® Soc. Coop. Terracoste. All right reserved. The Abruzzo section of the Gustav Line can be walked on foot in 7 days of walking. A slow journey, sometimes very demanding, but that can make you better appreciate the beauty of nature, explore more carefully the small villages, their history and get to know the welcoming inhabitants. The trail is also suitable for mountain bikes. The idea of the long trail along the Gustav line was based on the experience of a few bikers, who in 2013, on the 70° anniversary of the battle of Sangro, travelled the front line by bike from the mouth of the Sangro river in Abruzzo to the Garigliano river in Lazio. Although for bikers stages can be completed in a few days, we would recommend you take the time to immerse yourself in the slow pace of village life in your encounter between History and Nature. Il tratto abruzzese della Linea Gustav può essere percorso a piedi in 7 giorni di cammino. Un viaggio lento, a volte molto impegnativo, ma che può far apprezzare al meglio la bellezza della natura, esplorare con più attenzione i piccoli borghi, la loro storia e conoscerne gli accoglienti abitanti. Il cammino è percorribile in mountain bike. L’idea del tragitto lungo la Linea Gustav nasce dall’esperienza di alcuni bikers che nel 2013, in occasione del 70° anniversario della Battaglia del Sangro, hanno ripercorso la linea del fronte in bici dalla foce del fiume Sangro in Abruzzo a quella del fiume Garigliano nel Lazio. Anche se, per chi viaggia in bici, le tappe possono essere affrontate in pochi giorni, consigliamo di pedalare leggeri e prendersi il giusto tempo per immergersi nei ritmi lenti dei borghi attraversati, tra la storia ed il paesaggio. “Sulla Linea Gustav. Il cammino della memoria” è un percorso cicloturistico-pedonale che ripercorre il ricordo dei tristi eventi della II Guerra Mondiale che, nel periodo compreso tra gli ultimi mesi del 1943 ed i primi sei mesi del 1944, sconvolsero molti centri abitati in Abruzzo. La Linea Gustav fu una linea difensiva impiegata dai tedeschi per fermare l’avanzata degli Alleati, statunitensi e dell’Impero Britannico, che procedevano verso il nord, liberando i territori occupati dalle truppe tedesche. Taglia a metà in senso longitudinale l’Italia, nella sua parte più stretta, congiungendo la foce del Fiume Sangro, in Abruzzo, con quella del fiume Garigliano, nel Lazio. Attraversando anche il Molise e la Campania.